Twitter is a funny thing. For those unaccustomed to its power, it might just seem like a broadcast medium: a place to get your message out, period. But characterizing twitter or social media as such is completely missing the point. At its core, social media (both facebook and twitter) are tools for organizing groups of people with common interest, sharing information, or collaborating. For those of you interested in social media and its application to emergency management, a twitter group has formed around the hashtag #SMEM. This hashtag has attracted emergency managers, first responders, contractors, NGOs, volunteers, interested citizens and bloggers, such as myself. People go there to share information and best practices and to ask questions of the group, on an ongoing basis. 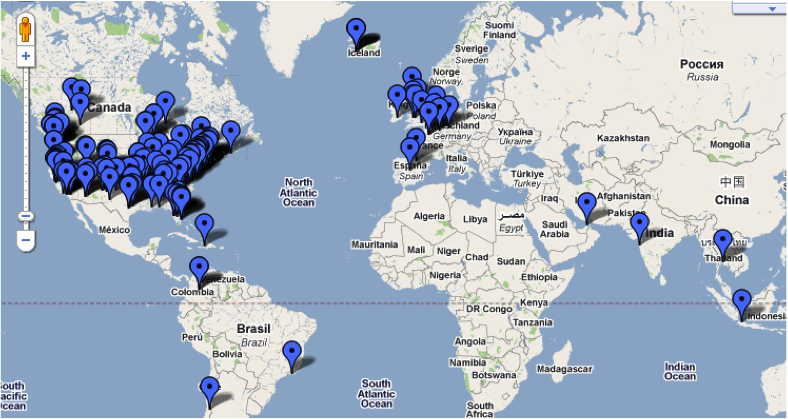 I have created a map of people using the hashtag in order to get a sense of its reach. To my surprise, people from all over the world have used the tag. But emergency response personnel and/or interested public information officers might not have the time to watch the tag very often, but check it from time to time hoping to see content they are interested in. This is why the concept of a weekly chat was proposed. This past Friday, Jan 28, the first #SMEMchat occurred. Our goals were simple: test the concept and gauge interest. I have summarized the chat below, and I hope it entices those who were not able to join us to try to mark their calendars for the next one. (Time/date, etc. will be announced on #SMEM). Jeff Phillips, an Emergency Manager from New Mexico, agreed to be the moderator and composed some questions to lead the discussion. Questions 1 and 2 dealt with ground rules and how people had heard about the tag after its creation on 11/11/10. A lot of people learned about it through the people they follow, including Jeff himself. Craig Fugate, FEMA Director, joined the chat and indicated that he heard about it at the IAEM conference in San Antonio, Texas. In fact, Craig sent out a tweet about the tag and it “blew up” soon after that. The third question was: “Are you aware that SMEM means bridging SM and EM? What does that mean to you? Why/how do you participate? This elicited some interesting responses but the consensus was “to learn from others” and to have a two-way conversation about how to best utilize social media for in the emergency management field. Some people pointed out that twitter was the quickest way to pass information worldwide. Others participate on the SMEM tag to “pass useful info to the general public”. The fourth question was “what are you doing locally/regionally to bridge SM & EM?” Jeff pointed out how in New Mexico they are using the power of social media in a “camp” format and that they have established local hashtags such as #NMEM, #NMFire, #NMStorm and #NMwx. As a side note, following Jeff @LosRanchosEM, is a great way to learn how to use social media to its full extent. Other comments about bridging SM and EM ranged from developing an American Red Cross team to monitor social media traffic and other info streams for situational awareness (from @zborst), to tweets for Air Crew alerts (@jack4cap), and educating peers. In fact, trying to educate other local emergency managers about the power of social media became a conversation thread. Several people indicated that their local agencies were still fearful of the medium, seeing it as “for teenagers” or fearful to engage due to legal concerns. Some people pointed out how useful social media would be for rural areas underserved by any other kind of media–which is a great point. The fifth question was about the SMEM wiki, were we aware of it? Jeff also asked for other links people followed. I mentioned #lgovsm which is a tag used in Great Britain to discuss social media’s application for local government in general. Others indicated that they use RSS feeds with keyword terms and then subscribe to blogs etc. Just by following the SMEM tag, however, can provide enough reading material to last a lifetime. People are very good about passing along good articles when they find them. Don’t use SMEM for branding. Don’t use it as a billboard. Don’t use interns who don’t have good etiquette. DO: ask questions on the SMEM tag. People love to engage. Last Question: “Should we do this again? How often? Move time around? Are you willing to host? Future topics.” There’s a lot in that one question. But the consensus was yes, we should do it again, fixed day, time each week in order to get more people to chat—e.g. they will be able to put it on their schedule. The majority thought just one or two meatier questions would suffice. But there wasn’t really a consensus on which question for next week, per se. But… that wasn’t the last question. Craig Fugate chimed in: “Branding issues and use of other hashtags, is there a need for the EM community to have a common way to share info?” This prompted a very good discussion about hashtag use during a crisis. In general, if you have a set tag (ala #NMstorm) that people are used to using, that is great. However, if you don’t, @FireTracker2 noted that you have to use the tag early in the event before the general public starts its own. If not, your tweets will be marginalized. He suggested just following the public’s lead: “USE WHAT YOUR AUDIENCE USES!– he yelled virtually. Cheryl Bledsoe (EM from Vancouver, Washington) stated: “I like seeing state tags like #CA #NM with the incident tag so users quickly know geographic region of threat”. Craig gave a shout out to Tweak the tweet—others mentioned that format as well. @IndianRiverCOEM indicated that @NWSChat was something worth looking at for good collaboration. It looks as if Indian River had the last word. Nonetheless, I think it was a great discussion and opportunity to collaborate. I look forward to the next chat. Join us! Folllow #SMEM for more info and to volunteer to host! Click here for a complete transcript. This entry was posted in Social Media and Emergency Management and tagged American Red Cross, craig fugate, Emergency management, Federal Emergency Management Agency, social media, Twitter. Bookmark the permalink. Wonderful guidelines, and Etiquette. We’re sharing it with our volunteer population as well. Defining how best to use the tag is a key and important step to improving the flow of the information. Thanks for providing the framework and sharing it!